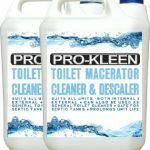 Prokleen Descaler will clean and enhance performance of your Macerator if used frequently. Use Prokleen Descaler on your macerator. Does your Macerator pump smell or run intermittently? Try using Prokleen Descaler Cleanser. Although this product is made by Prokleen it will descale and cleanse your Macerator pump. This product is cheaper than Saniflo Descaler but just as affective and is concentrated meaning you get three uses compared to Saniflo’s two. We have seen this product in use on various jobs lately with great results. 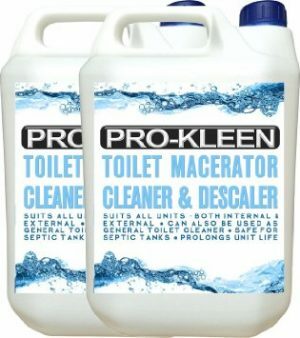 Prokleen descaler cleans and descales all Macerator pumps and any other macerator pump, Prokleen recommends you use their product 2-3 times per year depending on water hardness. Please do not use any kettle descalers as they don’t work, we have tried and experimented on old broken macerators with other branded descalers and none of them worked as good, kettle descalers are just for kettles. Do not use One Shot drain cleaners or any other industrial strength acid drain unblockers on a macerator as they can damage your macerator beyond repair, it clearly says this in the instruction booklet that comes with a new Macerator. 1, Turn off your Macerator, pour 1/3 f a gallon down your loo then flush it to mix the contents. 2, Leave the descaler to stand for up to two hours fizzing away cleaning and descaling. 3, Turn the machine back on and it should pump the existing contents out. 4, Flush your Macerator out with two full cisterns full of water to rinse the machine out. 5, If your Macerator is just connected to a kitchen sink or basin, fill it up twice to rinse out the macerator . If your macerator still smells you may need to repeat the process, for best results always descale your Macerator often especially it is brand new. 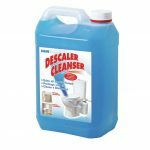 Descaler cleans and descales all domestic macerators and waste water pumps, Prokleen Descaler will cleanse and descale all other branded macerator pumps too. Order Prokleen Broysan Planus Descaler Cleanser Now!